Marketing Executives are involved in developing sales strategies as a way to enhance profits for the company. 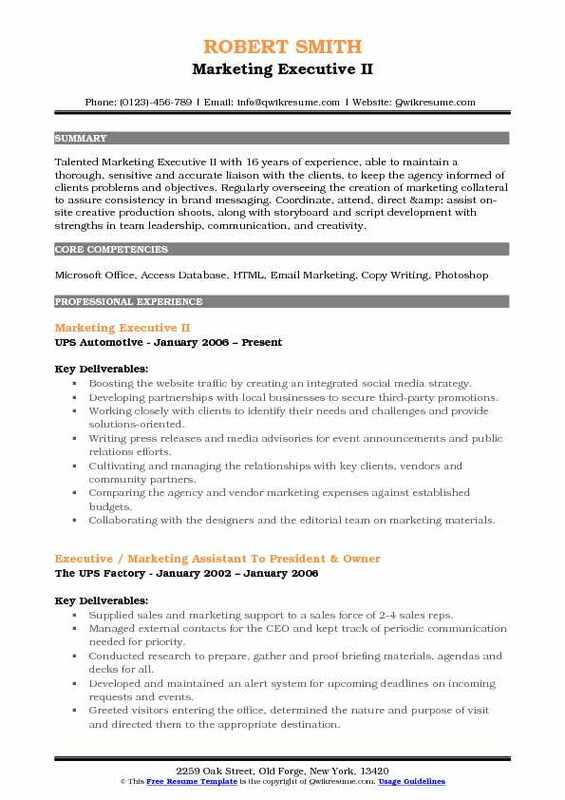 The best Marketing Executive Resume describes job responsibilities for these executives that include promoting ideas and services to increase sales volume, analyzing and investigating price with that of competitor’s, devising and implementing intuitive sales ideas or strategies, constructing promotional activities, writing reports, monitoring performances, compiling and distributing statistical or financial information, managing social media campaigns and working closely with other departments such as market research, sales, distribution staff and advertising. 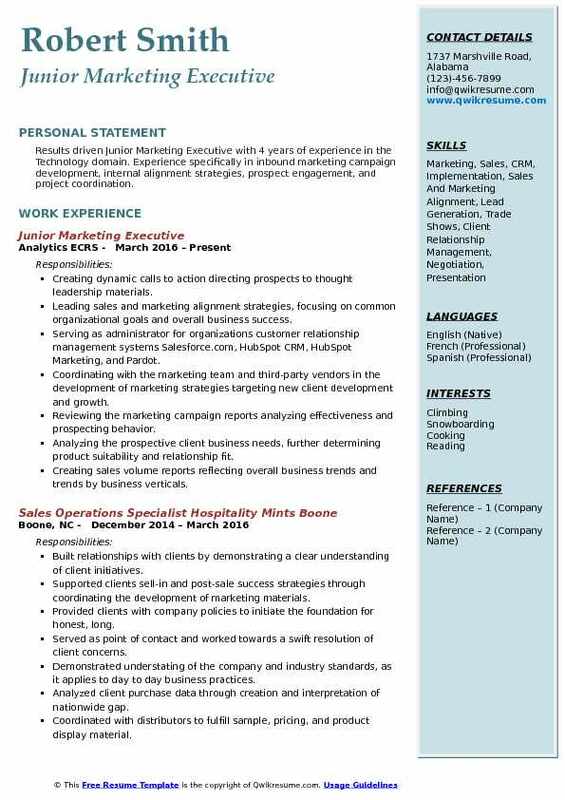 Candidates willing to take up marketing executive as a career need to demonstrate a thorough knowledge of strategic planning principles, proficiency in MS Office and marketing software, be familiar with social media and web analytics and strong creativity with commercial awareness. A degree in the marketing or business administration is considered as the minimum qualification for this role. Summary : Marketing Executive I dedicated to driving customer satisfaction and product visibility through prolific marketing strategies, with many years of experience in the tourism and marketing field in public relations, relationship building, and management. Created effective messaging using language, graphics, and marketing collateral. Developed partnerships with local businesses to secure third-party promotions. Wrote off-site SEO content such as press releases, guest blog posts and informational article suggestions, pitches. Wrote an average of 5-8 press releases and media advisories each month for event announcements and public relations efforts. Reviewed and edited destination website to guarantee high content quality. Summary : A highly motivated, experienced Marketing Executive with 22 years of experience in the Project Management domain who has demonstrated the ability to lead diverse teams of professionals to new levels of success in a variety of highly competitive industries, cutting-edge markets, and fast-paced environments. Strong technical and business qualifications with an impressive track record of hands-on experience in strategic planning, business unit development, project and product management. Processing the confidential financial information for property acquisitions and lease bid opportunities. Acting as the point of contact for communication of company between government, state, and local agencies. Researching and acquiring the pertinent logistical information, permits and legal restrictions regarding acquisitions. Producing complete marketing bid packages consisting of complete company profile along with potential. Creating internal and external marketing distributions for 18 locations nationwide. Researching the potential new development sites and expansion plans on current sites for maximization of company profit. Consistently communicating with the CEO and other executives to execute company directives. Co-created, developed and maintain daily company website providing logistics for e-commerce for customers. Maintaining correspondence with city managers, leaders, and consumers to assure customer satisfaction. Utilizing the extensive knowledge of computer-based programs such as adobe illustrator, photoshop, powerpoint Etc. to produce local and national advertisements, marketing materials and presentations for localities and internal company reference material. 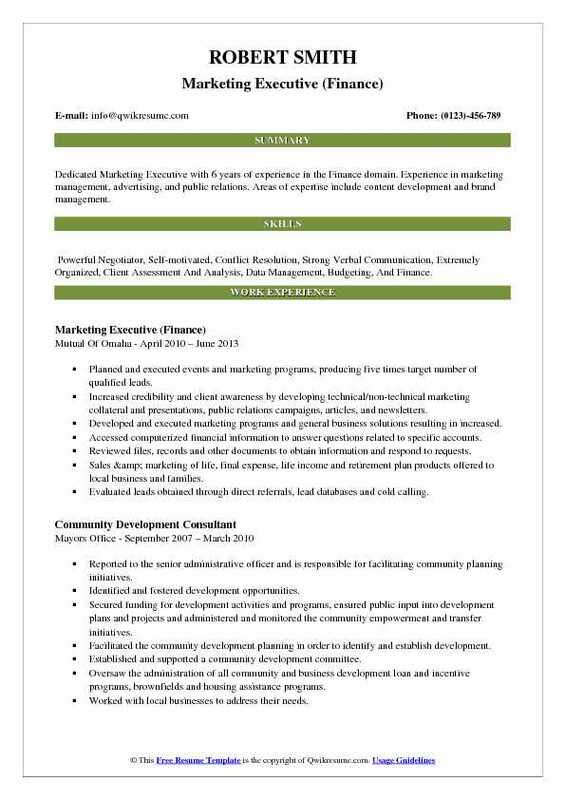 Headline : Dedicated Marketing Executive with 6 years of experience in the Finance domain. 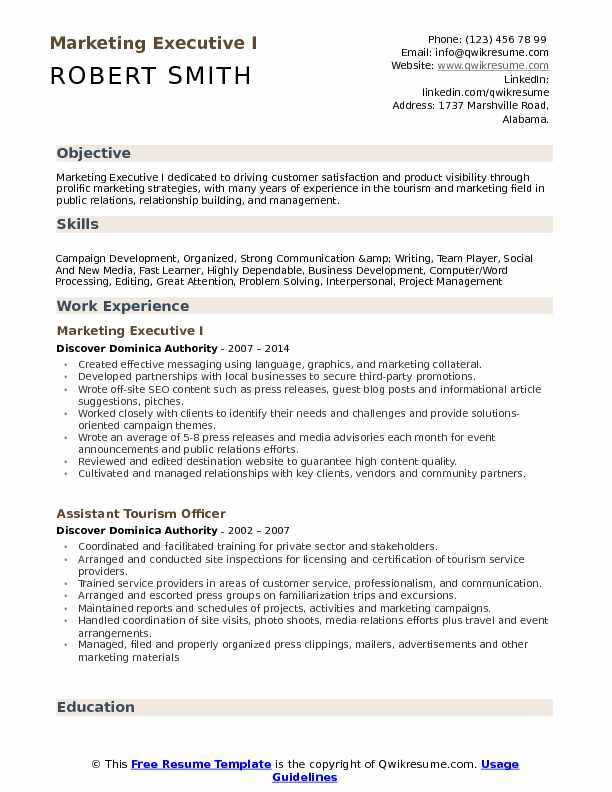 Experience in marketing management, advertising, and public relations. Areas of expertise include content development and brand management. 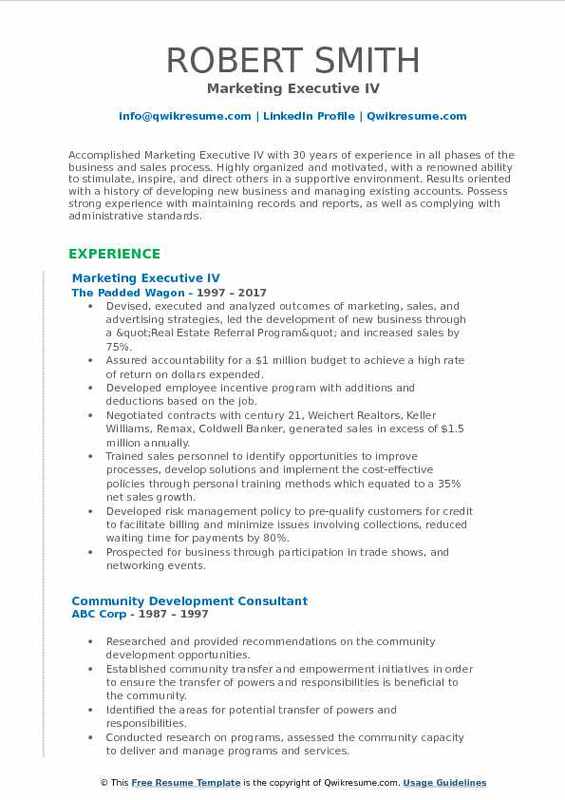 Skills : Powerful Negotiator, Self-motivated, Conflict Resolution, Strong Verbal Communication, Extremely Organized, Client Assessment And Analysis, Data Management, Budgeting, And Finance. Increased credibility and client awareness by developing technical/non-technical marketing collateral and presentations, public relations campaigns, articles, and newsletters. Developed and executed marketing programs and general business solutions resulting in increased. Sales & marketing of life, final expense, life income and retirement plan products offered to local business and families. 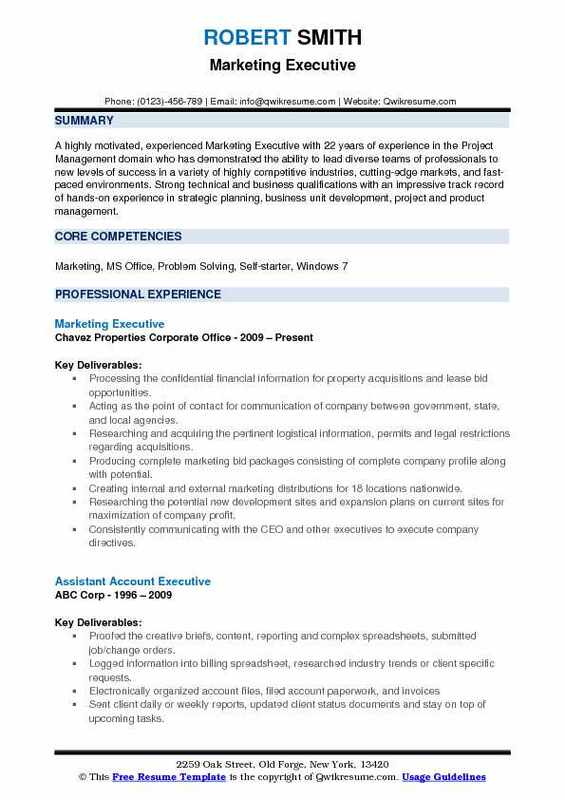 Summary : Accomplished Marketing Executive IV with 30 years of experience in all phases of the business and sales process. Highly organized and motivated, with a renowned ability to stimulate, inspire, and direct others in a supportive environment. Results oriented with a history of developing new business and managing existing accounts. Possess strong experience with maintaining records and reports, as well as complying with administrative standards. Devised, executed and analyzed outcomes of marketing, sales, and advertising strategies, led the development of new business through a "Real Estate Referral Program" and increased sales by 75%. Assured accountability for a $1 million budget to achieve a high rate of return on dollars expended. Developed employee incentive program with additions and deductions based on the job. Negotiated contracts with century 21, Weichert Realtors, Keller Williams, Remax, Coldwell Banker, generated sales in excess of $1.5 million annually. Trained sales personnel to identify opportunities to improve processes, develop solutions and implement the cost-effective policies through personal training methods which equated to a 35% net sales growth. Developed risk management policy to pre-qualify customers for credit to facilitate billing and minimize issues involving collections, reduced waiting time for payments by 80%. Prospected for business through participation in trade shows, and networking events. Demonstrated sound leadership skills and an exceptional ability to communicate with internal and external customers that increased consumer loyalty to the company: repeat customers increased by 35%. Spearheaded the evaluation, negotiation, corporate acquisition and transition of Cecere Moving Company to the Padded Wagon, 1999, and Jim Mahon Moving and Storage, 2009. Objective : Results driven Junior Marketing Executive with 4 years of experience in the Technology domain. Experience specifically in inbound marketing campaign development, internal alignment strategies, prospect engagement, and project coordination. Creating dynamic calls to action directing prospects to thought leadership materials. Leading sales and marketing alignment strategies, focusing on common organizational goals and overall business success. Serving as administrator for organizations customer relationship management systems: Salesforce.com, HubSpot CRM, HubSpot Marketing, and Pardot. Coordinating with the marketing team and third-party vendors in the development of marketing strategies targeting new client development and growth. Reviewing the marketing campaign reports analyzing effectiveness and prospecting behavior. Analyzing the prospective client business needs, further determining product suitability and relationship fit. Creating sales volume reports reflecting overall business trends and trends by business verticals. Interpreting the sales volume reports identifying areas of business growth and loss. Assisting in the development of marketing collateral distributed externally to both clients and prospects. Developing and managing the customer feedback surveys using tools such as Tech Validate to collect data used in product improvement initiatives, within sales proposals, and as content found on ECRS corporate website. 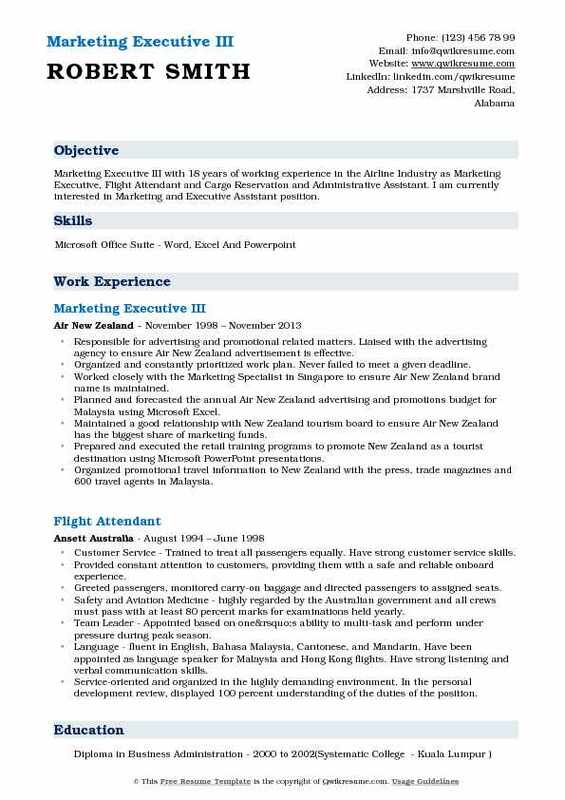 Summary : Marketing Executive III with 18 years of working experience in the Airline Industry as Marketing Executive, Flight Attendant and Cargo Reservation and Administrative Assistant. 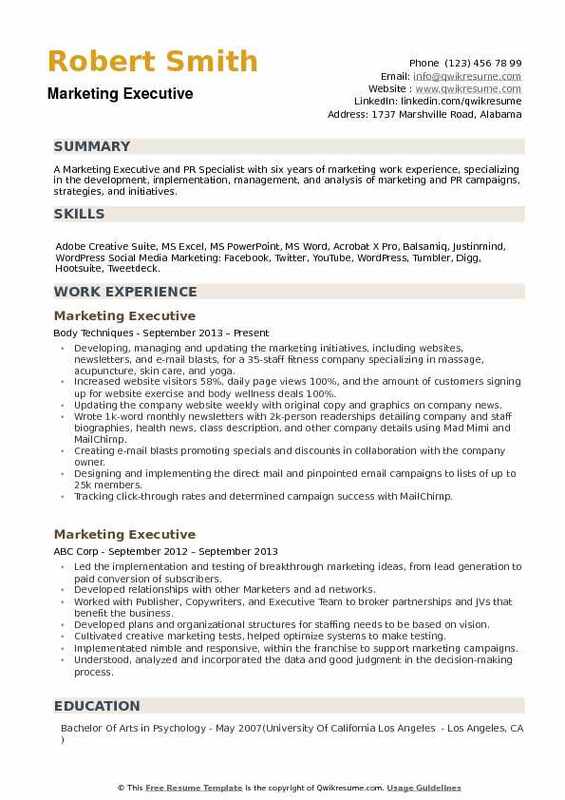 I am currently interested in Marketing and Executive Assistant position. Responsible for advertising and promotional related matters. Liaised with the advertising agency to ensure Air New Zealand advertisement is effective. Organized and constantly prioritized work plan. Never failed to meet a given deadline. Worked closely with the Marketing Specialist in Singapore to ensure Air New Zealand brand name is maintained. Planned and forecasted the annual Air New Zealand advertising and promotions budget for Malaysia using Microsoft Excel. Maintained a good relationship with New Zealand tourism board to ensure Air New Zealand has the biggest share of marketing funds. Prepared and executed the retail training programs to promote New Zealand as a tourist destination using Microsoft PowerPoint presentations. Organized promotional travel information to New Zealand with the press, trade magazines and 600 travel agents in Malaysia. Participated in selling New Zealand as a tourist destination at travel fairs. Managed Air New Zealand frequent flyer program (air points) in Malaysia. Recognized by the regional office in Singapore and Malaysia as a high performer. Possessed very good planning, organizing, interpersonal and customer service skills. Respected by all travel agents in Malaysia. Performance appraisal scored 92 percent. Summary : Dynamic marketing professional with 15 years of demonstrated project management experience launching B2C and B2B brands, services, and products for global organizations. Extensive experience in brand development and management, marketing communications including website management, social media marketing, product development, event promotions and trade show production. Analytical problem-solver, successfully leading cross-functional teams with effective communications and positive results. Recognized for strong leadership and analytical evaluation skills, supervised 5 operational departments and combined budgets totaling more than $6 million. Directing the brand management and positioning of company products, services, and global events. Conceptualizing and supervising the implementation of promotional campaign of annual international educational and tradeshow event by combining traditional marketing tools with new media, including website development, direct mail, e-mail, social media and networking, print and online advertising. Increased promotional event impressions by 30%, while decreasing the promotional budget by 25% over a 24 month period. Grew international event attendance during downward market trend by 10% through identification of new market segments and targeted promotions. Reduced printing expenses by $50,000 through analyzing audience behavior and satisfaction levels. Managed launch of new consumer association brand initiative, coordinating project timeline, internal resources selecting/managing vendors and project budget. Oversaw social media strategies and activities including website development, securing 2,000 members within 5 months of launch. Summary : Talented Marketing Executive II with 16 years of experience, able to maintain a thorough, sensitive and accurate liaison with the clients, to keep the agency informed of clients problems and objectives. Regularly overseeing the creation of marketing collateral to assure consistency in brand messaging. Coordinate, attend, direct & assist on-site creative production shoots, along with storyboard and script development with strengths in team leadership, communication, and creativity. Boosting the website traffic by creating an integrated social media strategy. Developing partnerships with local businesses to secure third-party promotions. Working closely with clients to identify their needs and challenges and provide solutions-oriented. Writing press releases and media advisories for event announcements and public relations efforts. Cultivating and managing the relationships with key clients, vendors and community partners. Comparing the agency and vendor marketing expenses against established budgets. Collaborating with the designers and the editorial team on marketing materials. Managing the project deadlines and monitoring the milestones through completion stage. Proofreading and approving the production and printing drafts of promotional materials. Summary : Experienced Digital Marketing Executive with 7 years of experience, who consistently delivers high-quality and results-focused marketing content. In-depth knowledge of social media marketing with expertise in identifying emerging market trends. Skills : Business Development, Multi-channel Marketing., Marketing, New Business Development, Prospecting, Proposal Writing, Sales Cycle Managment. Hired to lead marketing effort. Was given responsibility for product, sales and implementation services within 1 month of joining. Developed and implemented a product plan, rebranding strategy, business plan, and go-to-market strategy for a consumer-facing mobile application and business facing configuration platform. Worked closely with lead customers, senior management, customer facing groups, external contractors, and development to define, design and launch a "must have" mobile application and consumer adoption programs that became a market leading solution in less than 12 months with a customer base that was 100% referenceable. Retooled messaging, positioning and packaging as well as introduced buyer personas, buyer journeys, value-based pricing and sales enablement tools based on the voice of the customer. Defined and staffed a digital fulfillment business that outperformed industry average by 10x with 100% renewals and referrals. Developed highly targeted data-driven market adoption, air cover, and multi-channel marketing campaigns with actionable metrics that more than doubled conversion rates. Created $5.2m in communications ROI with a $10k investment, that secured a 71% share of voice over top competitors. 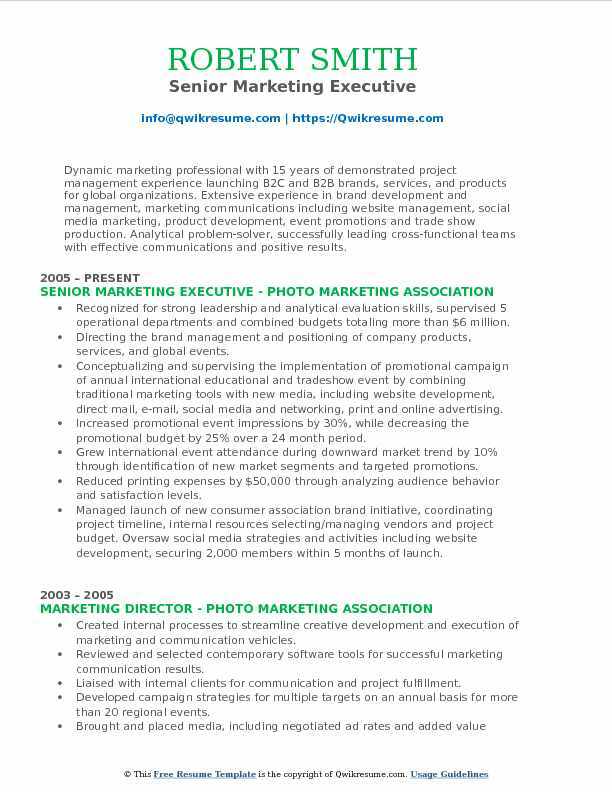 Headline : A Marketing Executive and PR Specialist with six years of marketing work experience, specializing in the development, implementation, management, and analysis of marketing and PR campaigns, strategies, and initiatives. 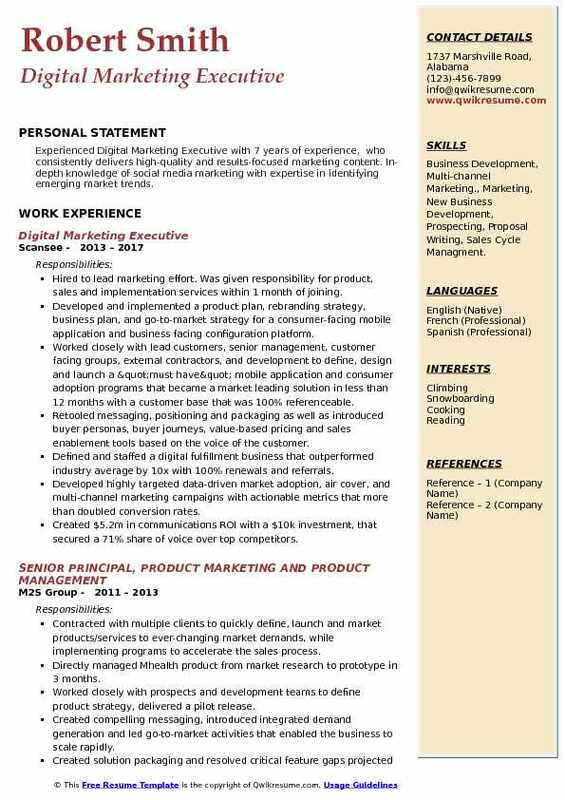 Skills : Adobe Creative Suite, MS Excel, MS PowerPoint, MS Word, Acrobat X Pro, Balsamiq, Justinmind, WordPress Social Media Marketing: Facebook, Twitter, YouTube, WordPress, Tumbler, Digg, Hootsuite, Tweetdeck. Developing, managing and updating the marketing initiatives, including websites, newsletters, and e-mail blasts, for a 35-staff fitness company specializing in massage, acupuncture, skin care, and yoga. Increased website visitors 58%, daily page views 100%, and the amount of customers signing up for website exercise and body wellness deals 100%. Updating the company website weekly with original copy and graphics on company news. Wrote 1k-word monthly newsletters with 2k-person readerships detailing company and staff biographies, health news, class description, and other company details using Mad Mimi and MailChimp. Creating e-mail blasts promoting specials and discounts in collaboration with the company owner. Designing and implementing the direct mail and pinpointed email campaigns to lists of up to 25k members. Tracking click-through rates and determined campaign success with MailChimp. Booking appointments and pitching services to business clients during 35 weekly cold calls and bimonthly client representative meetings.